August 7, 2016 | Larry Beasley and Associates Planning Inc.
Five Trends of Change in Urbanism – by Larry Beasley, C.M. July 10, 2016 | Larry Beasley and Associates Planning Inc. In my work in Canada, the U.S. and around the world, I am seeing the emergence of new trends that in most cities have not yet hit the urban agenda in a significant way. While the philosophy and practices of sustainability and green urbanism have enjoyed more and more focus, so other trends may be sneaking up on us that need just as much attention. Following are five of those trends. These are not the only surprising shifts to be expected as cities moves forward but they are certainly important ones. Whether for fear, opportunity or adventure – whether legal or illegal – whether by chance or planned – the people of the world are massively footloose. Population groups and individuals in vast numbers are moving away from places they don’t want to be to places they do want to be. Target destinations are successful cities in sanctuary societies. Such cities should expect unusually high growth trends that are sustained. High demand will not be a bubble, it will be real. 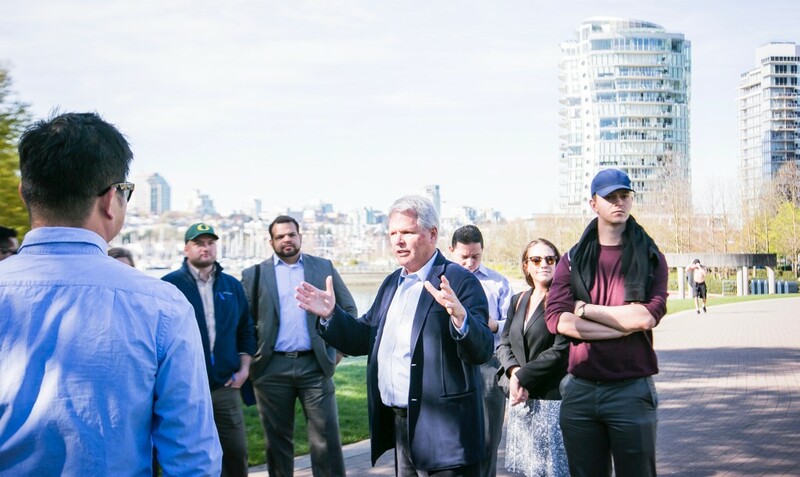 -For Vancouver, this creates vibrant and new economic opportunities that Vancouver’s economy is already starting to be built upon and our city is very dependent on this kind of growth as the traditional resource sector becomes less important. But, this is already putting sharp pressure on the housing market, creating a crisis of affordability that cannot be solved by conventional means. We will either start to punish those coming in, which will be negative and very short-sighted, affecting our world image, or we will find a way to give locals a leg-up in the market. 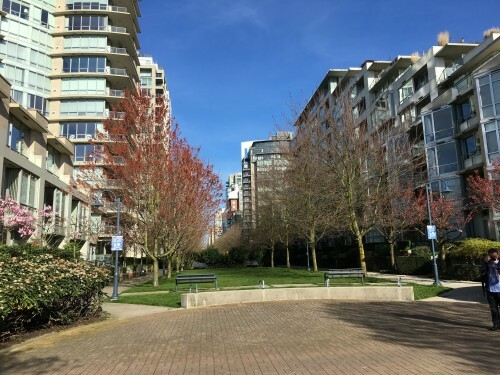 We have to start seeing the land and housing market in Vancouver as a two-layered market – the general market and the local market – that must be managed accordingly. Immigration also puts growth pressures on all public facilities and amenities and, therefore, tax dollars, so alternative funding sources are more important than ever. The system of Community Amenity Contributions (CACs) from new development that has been so fully realized and exploited in this city should be treasured and protected, not demonized. The idea is sweeping the world that the conventional reality of ownership or rental of services, property and things is too limiting and that a vast equity is embedded that can be tapped in new ways to the benefit of those who possess them and those who want to use them. Northern Europe is a hotbed of initiatives to share and barter, thereby stretching resources and bypassing government regulation and taxes. – The high value of the equities in Vancouver along with our being part of the international network of ideas will set off a similar trend here. We are only now beginning to understand the pros and cons of Uber, Air BNB and similar out-of-the-box market sharing initiatives. We are already one of the leading car-share cities in North America. We are on the cusp of bike-share. Implications for traditional retail are simply not yet understood. This is the tip of the iceberg of what we should expect from the share and barter economy – almost every commodity and service will be affected. Every year consumers worldwide buy more and more of the things that they need and want on-line. This is setting up a new pattern of product flows and a new constellation of support services and facilities. Commodity trading is digitized with significant goods movement implications. Every year more business is conducted digitally, rather than in face-to-face meetings and events. Information is accessed and shared instantly. -In Vancouver, conventional retail has to re-invent itself to compete and the local governments in our region have to support this process. Not only may local retail growth flatten, but independent retail could be very hard hit unless local business finds the edge to allow them to compete with digital business. The need for distribution facilities will expand and new patterns of distribution may emerge. Facilities for digital engagement will development and new service businesses will develop around these. Demographic trends are not working in the predictable ways of the past. Young people are selecting new and contrasting lifestyles rather than taking up where their parents left off. People are inventing new arrangements and settings for work, shifting commercial real estate trends and the very definitions of land-use. New kinds of households are forming. Older people are retiring earlier than expected and accessing their pent-up wealth to re-invent themselves in the last quarter of their lives – setting off unexpected demand profiles. -Vancouver Downtown, as a diverse, contemporary, healthy and wealthy community, is a crucible for these redefined citizens, their economic activity and alternative culture. As Millennials join the workforce and create new business ventures, demand for traditional offices is flattening while that for alternative workspace flourishes, setting off revitalization in unexpected places. From both young ‘gig’ workers to retired ‘consultants’, the rise of live/work is challenging our land-use and taxing definitions. White-collar industry is confounding both the imperatives of organized labour as well as the need for the old industrial land base. Adult living/learning aspirations is already transforming our educational campuses. One of the biggest technological changes on the horizon for cities is the evolution of autonomously driven vehicles. The implications will start to express themselves long before we have complete autonomous driving because every year more aspects of human control of vehicles is being turned over to computers. The implications are so vast and pervasive that almost nothing about cities will remain as we know it today. Cities need to start strategic planning now for these changes and setting up the financial capacities to support what needs to be done. Is this a 5-year problem or a 20-year problem? Well, that is the immediate question. – Vancouver will not escape the tidal wave of impacts and implications that this new transportation invention will spawn. Not only will the automobile infrastructure of our city become obsolete and need to be re-invented but so will our arrangements for movement of goods and delivery of services. The scale of Vancouver streets, the management of the interface of vehicles, pedestrians and other modes, the nature and demand for public transit, taxis and car hires, the amount and location of parking – these will all be fundamentally altered. The entire industry of human driving and all the jobs associated with it will come apart. July 5, 2016 | Larry Beasley and Associates Planning Inc. The Nordic Built Cities Challenge is coming to a conclusion over the next several months – stay tuned for true Scandinavian urban innovations. June 22, 2016 | Larry Beasley and Associates Planning Inc.
June 2, 2016 | Larry Beasley and Associates Planning Inc.
By Larry Beasley, C.M., F.C.I.P. Today I have been asked to talk about “gentle densification” – but actually, what this leads me to talk about is the transformation of suburbs. Now, we all know the complaints that we hear about our suburbs – they waste space; they gobble up nature; they are profoundly unsustainable, they are impossible to economically provide with services, they are socially exclusive. It can sound so bad. And yet, for most modern people, particularly in North America, suburbs are by head-and-shoulders the most popular way to live. In Canada, even after all the core-city revival we have seen over the last 25 years, over 60% of our people are still choosing suburban living – at best, we have only shifted that demographic by 5%. This is not something they have had to do, it is something they want to do – it is their strong preference. If asked, though they rarely are, they will sing the praises of green space, privacy, expansive living, safety for their children, good schools, like-minded neighbours, and freedom to do what you want, when you want on their own property. They see the suburban lifestyle as personally fulfilling and good for their families. And, frankly, most of them likely think we are all a little crazy with our fixation on sustainability and big urbanism. So, in the session today, I am going to try to reconcile this contradiction with a little help from gentle density. I am going to ask you to actually embrace the essence of suburban life – not its current form but its underlying appeal – and to use it as our guide in transforming this huge part of Canadian cities to work better to secure compatibility with the environment, and social harmony, and fiscal prudence, and cultural richness – the pillars of sustainability – that well-articulated “ecodesign” formula for smart growth that you see here [formula on screen], covering both the structure and the infrastructure of cities. For sustainable suburbs in the future we will have to find solutions that stay true to this formula but that offer it up in a fundamentally different package than is now our status quo. So I want to spend the rest of my time today talking about some of the solutions that can meet this tough test. And I want to start by highlighting some strongly held myths that I think are limiting our creative thinking about suburbs. Here they are [list on screen] – each one spoken about and written about by the urban cognoscenti of this country as though they are truths. Let me run through each one quickly. [Cars on the way out] No to this one. Automobile technology is now starting to move very quickly toward becoming a carbon neutral or clean energy producing machine. I think we will re-invent the car long before we wean ourselves from private mobility as a society. The car is here to stay. [SF homes becoming obsolete] No to this one too. As I see it, the fundamental pre-disposition that most Canadians have against density and height and loss of privacy – these will all limit the shift to dramatically different housing types. I think the changes that will work best will happen within the context of the pre-eminently single-family morphology of the suburbs. [People love current suburbs] I have found this is certainly not true. Everywhere I work, people tell me about the many changes and improvements they need and want in their suburban communities. People are not living in a fool’s paradise in post-war suburbs; they are just living in the only choice they’ve been given. I am sure we can offer better options – that also meet the test of sustainability. Well, what are the positive, acceptable directions for average suburbanites that would also be truly sustainable? I think we can take initial inspiration from a place that most people already feel good about and every city has good examples of, that people can go and have a look at – a place that has been overlooking for too long. I’m talking about the pre-war neighbourhoods, built between the early 1900’s and the 1930’s, which exist in every Canadian city and in every North American city. They are close-in now, but in their time they were certainly considered “suburbs” – in fact they are best known as “streetcar suburbs”. These neighbourhoods give us a very important cue about density. From discussions throughout the country we are beginning to understand that a sustainable, walkable neighbourhood starts to work at no more than 100 units-per-hectare, gross – or 40 units-per-acre [this is the unit count over all land covered, both public and private; for the equivalent unit density on only the private land, or what is called ‘net’ unit density, for discussion purposes, just double the numbers because roughly half of land in a city is dedicated public land] – and these older neighbourhoods have that and more, even if most people would not realize it. These are places average suburbanites would aspire to live in – in fact they are the very image of what people are often describing when they talk about or draw examples of ideal suburban life. These are places of real financial value and real emotional value. For a gentle approach to suburban transformation, let me just mention five other “take-homes” from the inspiration of these neighbourhoods. First, we can learn a lot from the prevailing scale: maintaining the one-to-three storey building heights as well as the fine-grained, smaller building pattern. I think most people feel “small” is simply better for the suburbs. Second, we can learn a lot from the diversity that you see in the old neighbourhoods. Generally they started with a simple pattern of blocks of apparently single houses extending out from a shopping street (where the streetcar used to stop), with offices or apartments over the shops. Then over time they just naturally diversified on all fronts: all kinds of households; many lot and house sizes and types (adding duplexes, back lane units, home conversions, infill housing – many people have chosen to keep their single family home and that is OK as well). They also have many architectural styles; a rich socio-economic range from low-income to quite wealthy households; and many kinds of retail outlets and a lot of independent retail potential rather than just “big boxes”; and many workplace opportunities and live/work possibilities. This diversity opens up economic opportunity close by as well as providing a plausible framework for a wide social engagement and supportive community life. Third, these neighbourhoods have many identifiable, meaningful places – “high streets” instead of strip malls with their sea of parking, small parks surrounded by housing other local greens, local meeting spots, markers and identifiers – these places engender localized uniqueness and they really stick in the memory. This fosters walking and it offers those “third places”, after home and work, where neighbours create their own special culture. There is always lush landscape and gardening. Nothing gives a place a more gracious, homey feel than nice rows of big street trees. Nothing is friendlier than an attractive front flower garden, unique to each house and tended by the residents. Nothing helps local food sourcing more than an individual vegetable garden. Nothing offers more privacy than a hedge and trees. Fourth, you will find the old neighbourhoods always have an infrastructure of community facilities that foster local self-help and interchange. There is a local school, even if it is used for more than primary education, and a community centre, often a seniors’ facility, and other immediate services that have come along as they were needed. And these have become economically supportable because the base consumer population is close by: 10,000 or more people within a 5 – 7 minute walk. Fifth, the typically two-way narrower streets and back lanes can be a big bonus. The traditional lane-and-a half driving area for a residential street with parking on one or both sides naturally calms traffic, is a lot safer for children at play and takes up a lot less land than the current standards. The back lanes offer utility access and trash handling without compromising the streetscape, and cut the number of vehicle crossings over the sidewalk. The lanes actually give the “front door” primacy back to the façade of a house rather than that ever-present “garage door” image. These neighbourhoods certainly accommodate the car but they do not let auto standards dominate every other consideration. Usually there is a grid of local streets, but even if there are cul-de-sacs, there is still good pedestrian connectivity in all kinds of walking linkages. Also they have a primary transit network that does not need subsidy because there are enough regular users – back to that basic density and diversity. And all of this adds up to the most important inspiration of all (and the theme of this whole talk) – gentle densification. These neighbourhoods are all about a delicate approach to intensification. The inspiration is to start with a respect for free-standing homes where they already exist, say at 10 to 20 units-per-hectare, gross, according to where they are. Then you infill alternatives that build up capacity layer by layer, achieving that base target 100 units-per-hectare, gross, in a painless way. It is not a big jump to get to the densities we need. In Canada, when we talk about suburban change, about all we usually talk about is transit oriented development, or TOD. This clusters density and usually high-rises around transit stations. The fact is that this is not a very popular form for most suburbanites because it is just too big and too intrusive. We need that more gentle approach – so let me offer just four alternative strategies. By the way, these are covered in a lot of detail in my new book, Ecodesign for Cities and Suburbs. The first is often called urban acupuncture, which is really a form of insinuated infill. This can work in both pre- and post-war suburban areas. In almost every community there are tracts of land that have been left undeveloped where you can add some new construction. These kinds of anomaly sites can fill out a neighbourhood and provide both diversity and slightly more intensity. A big opportunity for more comprehensive solutions is the huge suburban shopping centre site that has become obsolete in so many places across the country – although the best schemes keep the scale in line with the setting. To me, one of the best examples in the country is right here in Alberta – the Garrison Woods neighbourhood in Calgary, built as an infill on obsolete military land. These can be just as brutal as the TODs, but, if developed at lower heights, like Garrison Woods, the development can fit in nicely leaving much around it untouched. Like acupuncture for the body, though, even only one such intervention can solve problems for the whole surrounding area and give a gentle boost of density for sustainability. The second alternative has been called corridor transformation. This strategy is very attractive for the vast areas that were laid out after the war in almost every new suburb with massive strip retail along arterial streets served by large parking lots. The strategy has several steps that build upon one another. First, bus rapid transit, a very cheap form of rapid transit, is added along the arterial, which opens up more housing demand. Then those huge extra parking lots are slowly converted to low-scale multiple housing, with an emphasis on townhouses and garden apartments, leaving clusters of street-fronting retail and local offices to serve everyday needs. This is the key strategy in Toronto as they bring density to their existing communities. Here is a Vancouver example. But, again, this must be done gently, keeping a mid-rise or lower scale. This works best with stepped transition heights, setbacks and landscaped open space at the edges but, generally, the balance of the existing single-family area can be left relatively undisturbed. The result is that more people and more types of households are accommodated which not only diversifies the community, stabilizes local shopping and justifies more community services but also, over the long run, builds the demand for rapid transit. Once the density builds, the transit is simply upgraded. This is a very low impact solution for most existing residents so it does not need to challenge their sense of what is best for their home. At the same time, they start enjoying benefits of better proximity to the private and public services they need and can even start walking or cycling more for everyday activity. This can quite handily deliver another third of the base sustainable density that suburbs need. The third approach goes right back to that pre-war suburban inspiration and brings it forward in time as a complete unit – I’m talking about replicating streetcar suburbs. This could bring refreshed vitality to the standard model of those brand new neighbourhood subdivisions out on the fringe that we all know are going to continue to be built. Let’s face it, even as I have spoken this morning, several hundred units have been approved somewhere in Canada of these standard conventional subdivisions. But designing these with a different model can certainly go a long way to giving the suburban consumer what they tell us they really want – what they dream as their ideal form of community. I’m using here pictures from a particularly good example in Perth, Australia, called “Subiaco”. There is no reason that the old pattern cannot be copied when we lay out new areas – narrower streets, back lanes, pedestrian and bike networks, housing diversity, corner and street-lined retail, landscape, and, most of all, zoning flexibility for incremental additions over time, without all the fuss of rezoning. Right now in Canada, a great example of this approach is happening in Saskatoon on lands at the urban edge that the City there had land-banked. Needless to say, we will have to change all the standards and subdivision rules and a host of regulations to shift back to the traditional format. So be it. No one developer can do it alone but a partnership of progressive developers and local government authorities can make the sweeping regulatory changes that are needed. In new development areas, this alternative model can close in on the base sustainable density that we need in a very handy, market-attractive way. The last alternative is the one that is just beginning to be taken up in a few Canadian cities. I’ll call it discreet intensification. Some people would refer to this as “invisible density” or “hidden density”. One of the leaders in this approach has been my city of Vancouver where it has been taken up in a big way in our established neighbourhoods. It is a slow process of adding housing units in an organic way that has minimum effects on the existing pattern of things in the suburbs. This strategy primarily features secondary suites and laneway housing and very tiny infill projects like tri-plexes and four-plexes, usually undertaken by small builders for existing ratepayers, who might experience some impacts but also enjoy the direct profits from the changes. In Vancouver, the secondary suite revolution started as an illegal move by homeowners to find ways to support high mortgages but has subsequently been legalized, through an admittedly laborious process, so units can now be offered easily to students and single parent families and modest income households. Laneway houses rely on the historic footprint of the back garage building, usually incorporating a parking space. So far, they can only be rented rather than sold but, again, great diversity is added to the community by these added units. You might look at this as an easy way to at least double the density in an area over the long run in a way that most people will not even notice – again this helps us close in on that base density target that we need – that final one-third of densification of those existing suburbs. Imagine if this is not just enabled in existing suburbs but also, as I mentioned before, built in as an option from the get-go in new subdivisions. The kind of change that I have been talking about today can fill in and diversify Alberta communities in the quietest possible way – to a level of intensity so they are more compatible with their natural setting and affordable and servicable – without the shocking impacts, the displacement and the political wars that we have tended to see in the past decades. In Canada, we will continue to revitalize and intensity our core cities and that is all to the good. But most of the growth of our cities in the next century will happen in our suburbs, where I have no doubt over half of our citizens will continue to prefer to live. So, suburban transformation is the big move for our future – and we are going to have to change all the rules and regulations and standards that have so badly distorted these suburbs and have made it illegal to build great places. But, living as we do in a democracy, we also have to invent a way of doing this that will appeal to people so that they allow it to happen at a political level and then embrace it widely as consumers. I am convinced that gentle densification is the only way we can find this kind of essential reconciliation. It will provide the hospitable urbanism that suburbanites want while supplying the responsible urbanism that all Canadians need. May 4, 2016 | Larry Beasley and Associates Planning Inc.
Great Street: Chiswick High Road – London. May 2, 2016 May 2, 2016 | Larry Beasley and Associates Planning Inc.
April 20, 2016 | Larry Beasley and Associates Planning Inc. 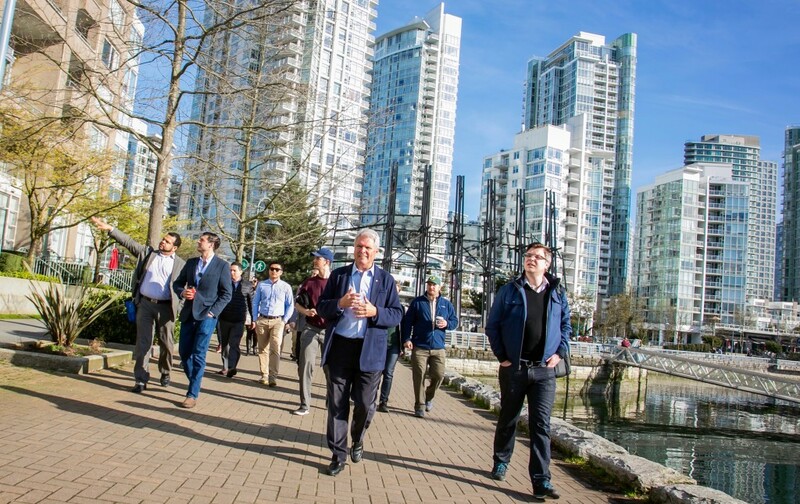 In March 2016, second-year students in the Baker Program in Real Estate embarked on a trip to Vancouver, British Columbia to meet with the people and companies that have played a hand in shaping Vancouver into the celebrated international city it is today. Starting with a bold plan hatched in the 1980s to connect the city to its waterfront, Vancouver has spent the following decades on a transformation spree that is the envy of urbanists the world over. Throughout a five-day itinerary, students visited the projects and neighborhoods that epitomize this transformation. The trip began by meeting at the waterfront with Larry Beasley, former Co-Director of Planning for the City of Vancouver. Beasley was instrumental in driving the City’s efforts to build the seawall, the pedestrian and bike paths along the water, and in crafting the zoning and developer requirements that would allow for the appropriate density, housing types, and public spaces. The resulting development has been coined “Vancouverism,” a planning movement that has spawned inspiration in hundreds of other cities across the globe. Beasley spoke of specific measures such as mandating the right amount of space between towers so that occupants aren’t uncomfortable (90 feet), and requiring ground floor uses of retail in the right areas, as well as townhouse-style housing product along the edges of residential towers that are popular with families moving from less-dense neighborhoods. Underground parking also provides for efficient land-use without the impediment of parking lots or lost floors above-ground. The urban form along the waterfront has also been carefully designed to allow for large view corridors so that residents along the waterfront and further-inland are able to see the water. The spaces are ideal for streetscapes, parks, and openings that enhance the pedestrian experience, and provide residents with public amenities right at their front doorstep. Another challenge is how to manage the two modes of travel along the waterfront. No- not cars! But pedestrians and cyclists. 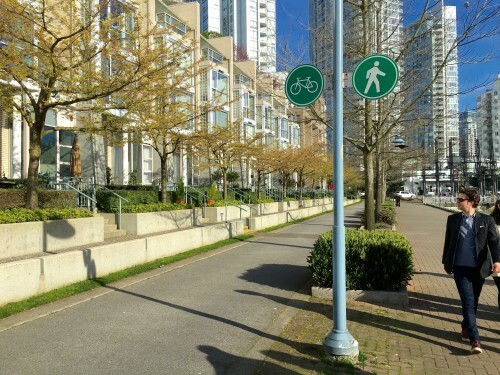 The waterfront paths are split between bike and pedestrian modes, with the pedestrian path along the edge of the seawall, which is embellished with ample trees, planters, and benches so that residents may enjoy the water at their leisure, or get to where they’re going with ease. The split helps to keep accidents to a minimum, and the flow of travel at the right pace. In addition to parks and open space, the waterfront development included the construction of a new school and playground so that local residents could easily raise children in the area without the need of a car or bus to deliver their children to school. The convenience factor and space programming was intended to “crack the nut” on getting suburban families into the City- and it succeeded. Beasley, the team at the City, and the waterfront developers came together with the public at large to determine what was necessary to drive interest in families to move to the City through hundreds of public meetings, thousands of private consultations and conversations, and a marketing effort that played directly to each housing group. Through a strategy of transparent and open engagement, Vancouver developed the model for comfortable and sustainable urban living. Though a City of over 600,000 (2.3 million in Metro-area), Vancouver can be comfortably traveled across by foot or bike in the fraction of an afternoon, and the City is consistently ranked as one of the most livable cities on the planet by a range of publications. Newer developments such as the Olympic Village area even incorporate their own greywater-recycling and efficient power and heating as a whole integrated system- the City even boasts its own steam district, and new transit stations have recently opened to continue expanding the light-rail network. The City is a shining example of what can go right in a City’s development when parties come together collaboratively, and effectively. Part Two will explore the history behind the 1986 World Expo site, and Concord Pacific’s development along the waterfront.